Are you a rebel at work? I heard a former CIA director, Carmen Medina, speak at BIF 9 about being a rebel at work and I was intrigued. The language was provocative, yet it felt familiar. My language for the same thing is “change agent”. Corporate America, Government, Non Profits all need these counter-cultural people to step up and lead to a better place, even if they don’t quite fit in. Whether called a rebel or change agent, or the people in “orbit around the giant hairball” as author Gordon MacKenzie calls it. Rebels and change agents need their organizations and their organizations need them. What resonated most, however, with Carmen Medina’s remarks was her recognition that being a rebel was not license to be disorderly, disrespectful or even disgruntled. No, rebels are uncharacteristically optimistic. 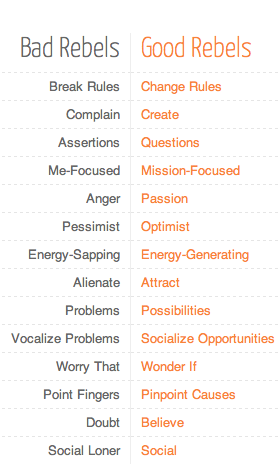 Here is a helpful chart from her website www.rebelsatwork.com that contrasts good and bad rebels: I would add another characteristic in that I think Good Rebels are Courageous. They are willing to speak the truth in a way that it can be heard, even if it means it might not be in their personal best interest. That kind of a constructive candor is gold when it comes to business. And, in my experience, one of the side effects of working in a design thinking manner is that rebels have a place to share their candor and wisdom, where courage is contagious. In one business where I consulted, we even institutionalized this idea, creating The Ambassador Team, people from various positions in the organization nominated by their peers to share the truth with the leadership team on a regular basis. To the leadership team’s credit, they listened, invited more candor and took productive action on what they were learning. Morale improved. Performance improved. Candor became common. In his book High Commitment High Performance: How To Build a Resilient Organization for Sustained Advantage, Michael Beer shares his research on how important these honest conversations are to a business. When my business partner and I met with him to discuss our work and how we had reapplied his theory, he was impressed with the outcomes, and how design methods and mindsets had delivered them. So, have you nurtured your Rebel at Work today, perhaps by inviting them to participate in a more design thinking work experience where candor and curiosity are encouraged? They may just be the medicine your organization is needing. Check out the stories at www.rebelsatwork.com and see if you can see yourself in those stories or perhaps someone you might nurture in your organization.